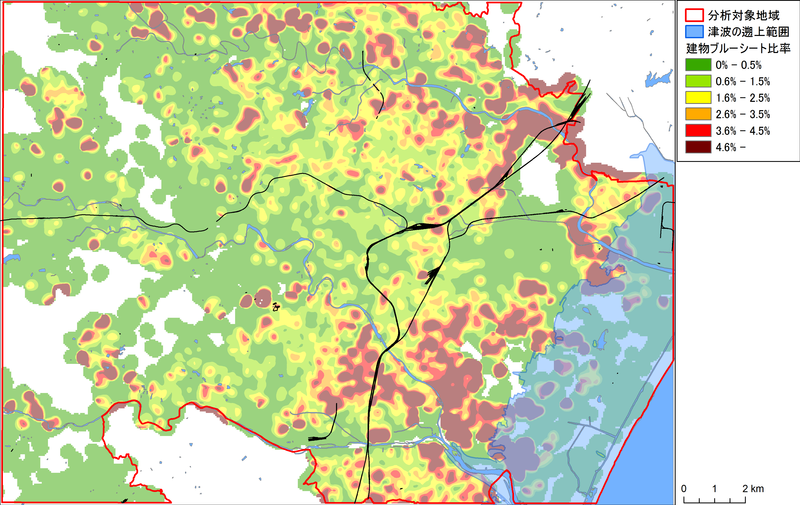 The 2011 East Japan Earthquake resulted in structural damages to buildings in wide ranging areas and damages concentrated especially on artificially modified lands such as land filled alluvium and flattened hills (Murayama, 2011). Geographical distribution of structural damages is hard to grasp; local authorities keep track of individual structural damages from emergent inspections to issue Disaster Victim Certificate, but such data is difficult to obtain for privacy issues. My previous attempt to quickly locate structural damages by address matching the residential address of the evacuees in the list of evacuees (provided that such list is made public) works to some extent (Isoda, 2011), but I found, by visiting the areas that had many evacuees, that such indicator will be biased towards areas with higher rate of tenants; many owner-occupiers of the damaged houses had nowhere else to go but to stay in their damaged houses. The alternative approach proposed here is to identify blue-sheets clearly visible in high-resolution satellite image or aerial photo. Blue-sheets, large plastic sheet used in construction often in blue but sometimes in green or orange, are used to cover broken roof, window or ground as an emergent measure mainly to prevent rain water leakage. In Sendai area, Google Earth has image taken on 6 April 2011, well after the earthquake on 11 March to apply such emergent measures but early enough that the real repairs start. Since blue-sheets on roofs are more clearly visible that that on the ground or on windows, this indicator of structural damage closely reflects damages on the roof but less precisely on damages on the side or on the ground. Moreover, damages that require blue sheet happen frequently on traditional tile roof as it can shift or crack, so the indicator will be biased for the design (and hence the age) of the building. However, it should be noted that houses with traditional tile roof tends to have heavier structural damage since the tiles are heavy and higher center of gravity of a house amplifies the oscillation. Finally, blue-sheet are usually not be applied to totally collapsed buildings or buildings that users abandon, so the structural damages to tsunami hit area would not be able to examine. Visually interpreting the satellite image, blue-sheets were categorized as follows: (1) on houses with tilted roof; (2) on buildings with flat roof; (3) on housing plot (on ground); (4) on other grounds; (5) other blue-sheets. The blue-sheets are represented by points by a point for a building basis. Using the blue-sheet on buildings (category 1 and 2), the point density was calculated and that was divided by the point density of buildings (Fig 1). The rate of blue-sheet in Figure 1 shows the city center is not much affected but alluvial plain in the south and that along the Nanakita river in the north is heavily affected. In order to examine the effect of land form on the rate of blue-sheet (i.e. the intensity of structural damage), the rate of blue-sheet is overlaid on land form category in Figure 2, and the result is shown in Figure 3. 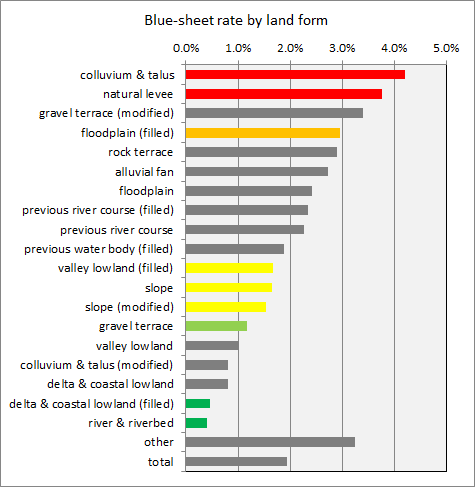 Figure 3 shows the rate of blue-sheet per buildings by natural or artificial land form. The area inundated of tsunami is not included in the analysis. Artificially modified land forms are indicated in parentheses in the labels in the figure. Pair-wise tests of statistical significance were also applied and land forms are grouped into five groups, shown with colors in the figure, that had significantly different rates at 1% significance level (Bonferroni adjustment applied). Difference in rates were not statistically significant between land forms indicated with the same color, and land forms indicated in grey was not significantly different to adjacent colored land forms. 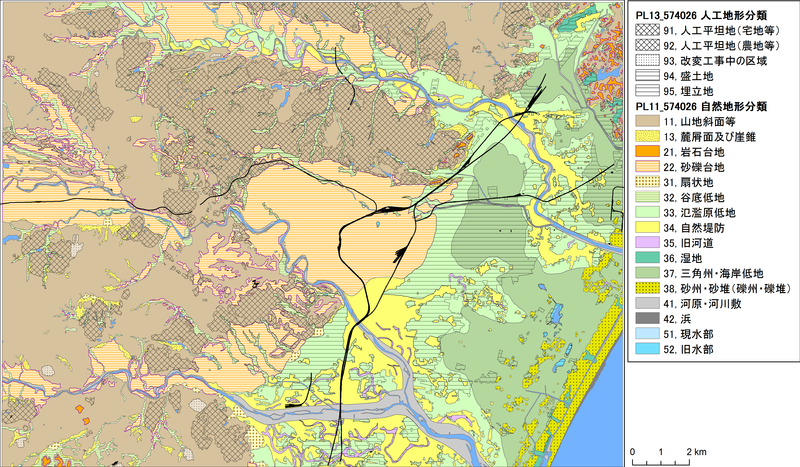 From this result, colluvium, often steeply sloped, and natural levee had the highest rate of damage, then on floodplain. Filled valley lowland and modified or natural slope are usually in the artificially flattened housing land, and has the largest share of housing in Sendai, has a slightly but significantly higher rate of blue-sheet than gravel terrace, where the city center lies on. Delta & coastal lowland and river & riverbed having lowest rate of blue sheet is intriguing, probably buildings on such areas (very few building anyway) were actually inundated by tsunami and blue-sheet were not applied as buildings were damages severely by the tsunami.